Why the Mona Lisa Stands Out | Passing Through . . . . In 1993 a psychologist, James Cutting, visited the Musée d’Orsay in Paris to see Renoir’s picture of Parisians at play, “Bal du Moulin de la Galette”, considered one of the greatest works of impressionism. Instead, he found himself magnetically drawn to a painting in the next room: an enchanting, mysterious view of snow on Parisian rooftops. He had never seen it before, nor heard of its creator, Gustave Caillebotte. When Watts looked into the history of “the greatest painting of all time”, he discovered that, for most of its life, the “Mona Lisa” languished in relative obscurity. In the 1850s, Leonardo da Vinci was considered no match for giants of Renaissance art like Titian and Raphael, whose works were worth almost ten times as much as the “Mona Lisa”. It was only in the 20th century that Leonardo’s portrait of his patron’s wife rocketed to the number-one spot. What propelled it there wasn’t a scholarly re-evaluation, but a burglary. In 1911 a maintenance worker at the Louvre walked out of the museum with the “Mona Lisa” hidden under his smock. Parisians were aghast at the theft of a painting to which, until then, they had paid little attention. When the museum reopened, people queued to see the gap where the “Mona Lisa” had once hung in a way they had never done for the painting itself. The police were stumped. At one point, a terrified Pablo Picasso was called in for questioning. But the “Mona Lisa” wasn’t recovered until two years later when the thief, an Italian carpenter called Vincenzo Peruggia, was caught trying to sell it to the Uffizi Gallery in Florence. The French public was electrified. The Italians hailed Peruggia as a patriot who wanted to return the painting home. Newspapers around the world repro­duced it, making it the first work of art to achieve global fame. From then on, the “Mona Lisa” came to represent Western culture itself. In 1919, when Marcel Duchamp wanted to perform a symbolic defacing of high art, he put a goatee on the “Mona Lisa”, which only reinforced its status in the popular mind as the epitome of great art (or as the critic Kenneth Clark later put it, “the supreme example of perfection”). Throughout the 20th century, musicians, advertisers and film-makers used the painting’s fame for their own purposes, while the painting, in Watts’s words, “used them back”. Peruggia failed to repatriate the “Mona Lisa”, but he succeeded in making it an icon. Although many have tried, it does seem improbable that the painting’s unique status can be attributed entirely to the quality of its brushstrokes. It has been said that the subject’s eyes follow the viewer around the room. But as the painting’s biographer, Donald Sassoon, drily notes, “In reality the effect can be obtained from any portrait.” Duncan Watts proposes that the “Mona Lisa” is merely an extreme example of a general rule. Paintings, poems and pop songs are buoyed or sunk by random events or preferences that turn into waves of influence, rippling down the generations. “Saying that cultural objects have value,” Brian Eno once wrote, “is like saying that telephones have conversations.” Nearly all the cultural objects we consume arrive wrapped in inherited opinion; our preferences are always, to some extent, someone else’s. Visitors to the “Mona Lisa” know they are about to visit the greatest work of art ever and come away appropriately awed—or let down. An audience at a performance of “Hamlet” know it is regarded as a work of genius, so that is what they mostly see. Watts even calls the pre-eminence of Shakespeare a “historical fluke”. Shamus Khan, a sociologist at Columbia University, thinks the way we define “great” has as much to do with status anxiety as artistic worth. He points out that in 19th-century America, the line between “high” and “low” culture was lightly drawn. A steel magnate’s idea of an entertaining evening might include an opera singer and a juggler. But by the turn of the 20th century, the rich were engaged in a struggle to assert their superiority over a rising middle class. They did so by aligning themselves with a more narrowly defined stratum of “high art”. Buying a box at the opera or collecting impressionist art was a way of securing membership of a tribe. Although the rigid high-low distinction crumbled in the 1960s, we still use culture as a badge of identity, albeit in subtler ways. Today’s fashion for eclecticism—“I love Bach, Abba and Jay Z”—is, Khan argues, a new way for the bohemian middle class to demarcate themselves from what they perceive to be the narrow tastes of those beneath them in the social hierarchy. The innate quality of a work of art is starting to seem like its least important attribute. But perhaps it’s more significant than our social scientists allow. First of all, a work needs a certain quality to be eligible to be swept to the top of the pile. The “Mona Lisa” may not be a worthy world champion, but it was in the Louvre in the first place, and not by accident. Secondly, some stuff is simply better than other stuff. Read “Hamlet” after reading even the greatest of Shakespeare’s contemporaries, and the difference may strike you as unarguable. Compare “To be or not to be”, with its uncanny evocation of conscious thought, complete with hesitations, digressions and stumbles into insight, to any soliloquy by Marlowe or Webster, and Shakespeare stands in a league of his own. Watts might say I’m deluding myself, and so are the countless readers and scholars who have reached the same conclusion. But which is the more parsimonious explanation for Shakespeare’s ascendancy? A study in the British Journal of Aesthetics suggests that the exposure effect doesn’t work the same way on everything, and points to a different conclusion about how canons are formed. Building on Cutting’s experiment, the researchers repeatedly exposed two groups of students to works by two painters, the British pre-Raphaelite John Everett Millais and the American populist Thomas Kinkade. Kinkade’s garish country scenes are the epitome of kitsch—the gold standard for bad art. The researchers found that their subjects grew to like Millais more, as you might expect, given the mere-exposure effect. But they liked Kinkade less. Over time, exposure favours the greater artist. 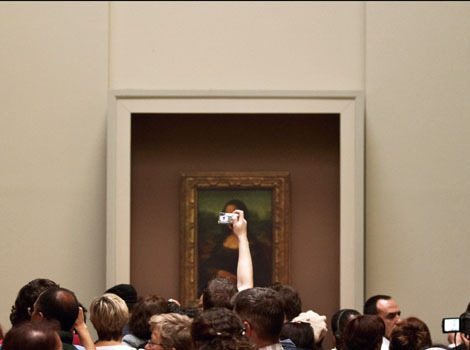 Top Flocking to her: the “Mona Lisa” in her room at the Louvre, surrounded by admirers. Or are they sheep? James Cutting, Mona Lisa, Musee d'Orsay, status anxiety and worth, What make art great?